Originally from Columbus, Ohio, Dan Hitchcock is a saxophonist and multi-instrumentalist with a deep love for swinging jazz music. Hitchcock is a recent UNCG graduate and currently lives in Greensboro. While at UNCG, he began the lifelong process of developing a voice as an improviser, with influences spaning east and west coast, old and new. 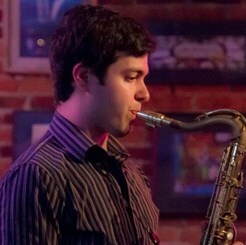 Dan is currently a member of the Camel City Jazz orchestra, Souljam, Envision, Brandon Lee/ Aaron Matson Quintet, his own jazz quartet, and has performed with numerous groups in the area including the Piedmont Triad Jazz Orchestra, Thomas Linger Quartet, North Carolina Symphony Pops, Roanoke Symphony Pops, and Dirty Laundry.